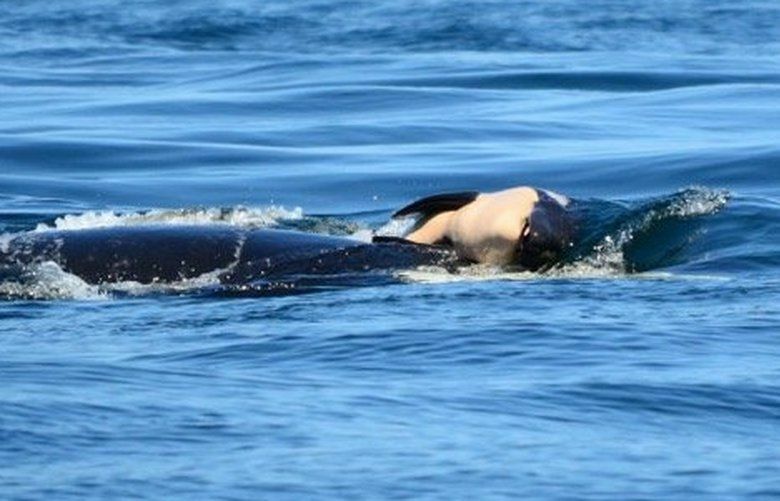 A grieving mother orca continued to carry her calf around the Salish Sea for the fourth day since it died shortly after birth. 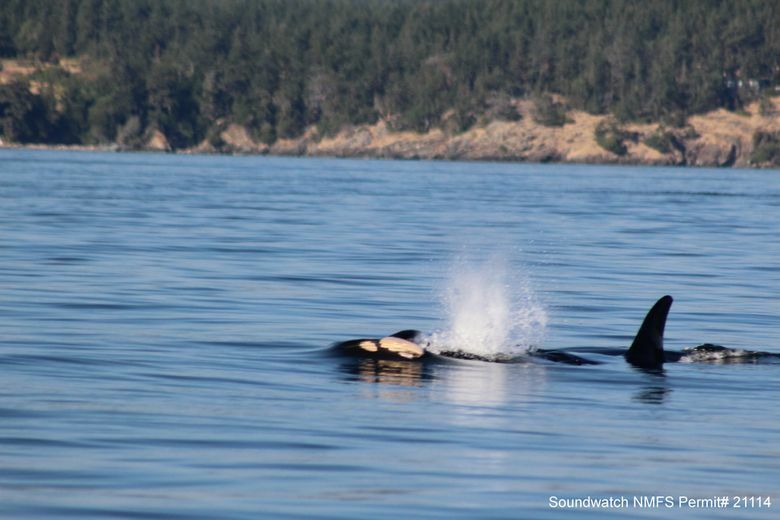 SAN JUAN ISLANDS — Researchers continue to keep vigil Friday as an endangered orca mother carried her dead calf for a fourth straight day in the Salish Sea, a heart-rending spectacle that has drawn worldwide attention. “It’s tough to watch and hard work, but we won’t give up as long as she doesn’t,” said Taylor Shedd, program coordinator for Soundwatch, who is watching over the grieving mother and her calf. 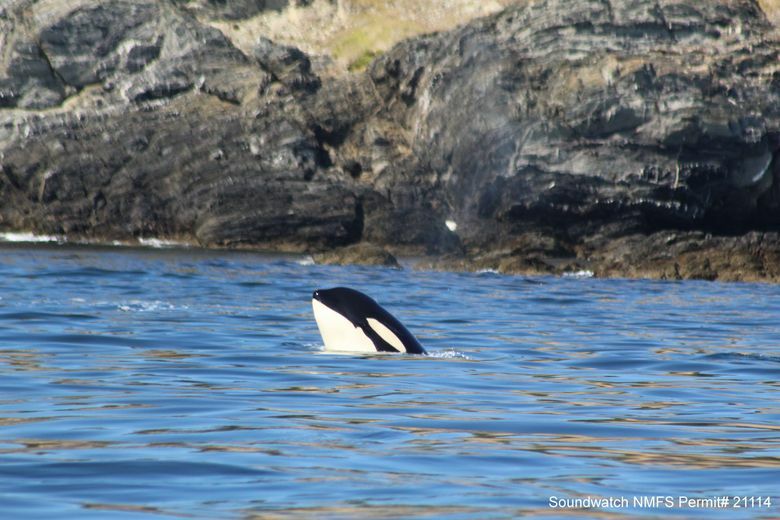 Through Friday evening, as researchers left her for the night, the orca known as J35 was carrying the dead calf on her rostrum, the area of her head just behind the nose. 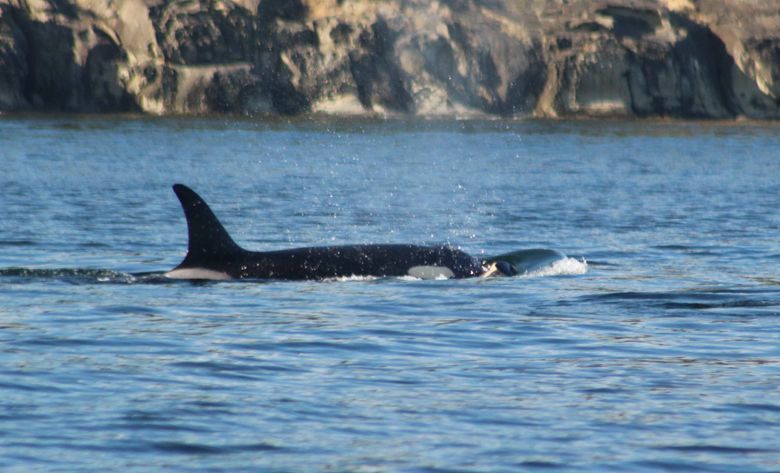 The orca is traveling with the rest of her family, all within 400 yards of one another. The younger whales, including her other calf, are foraging, and Shedd said he hoped they may be catching fish to feed her, but he could not tell for sure. Her movements are slowing. J35 carried the calf 20 miles one night into the next morning. But Friday, a day with strong tides because of the full moon, she stayed in the same spot all day with her family, Sledd said, facing into the current. She also at times carried the calf by her teeth, clamping onto one of its fins. Every time it slips away she takes a deep dive to retrieve it. “She pauses, sinks her midsection and her tail, arches her back a little then takes this big arching dive, I think it is to retrieve that calf in the current and it is traveling fast,” Sledd said. Sledd has watched her more than 30 hours now on the water. “I can’t even imagine how tiring and emotionally stressful it is for her. Shedd said Soundwatch is keeping vessels clear of J35 and educating those close by, and monitoring her health, her behavior and whether she decides to drop the calf. The Soundwatch program is run by the Whale Museum at Friday Harbor. The program has educators on the water every day to remind boaters to keep at least 200-plus yards away from marine mammals. The whale-watch fleet has been voluntarily keeping clear of J35 and her family to give her space and privacy. 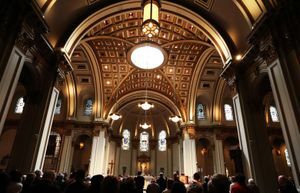 Barbara King, professor emerita of anthropology at the College of William and Mary and author of the book “How Animals Grieve,” said the duration and extent of J35’s efforts indicate intense grief. “This is a real change from baseline behavior, she is laboring, not taking care of herself, not acting the way she normally would in order to keep her baby,” King said. King has documented grief in primates, elephants, companion animals, farm animals and others. The gathering of other females with J35 on Tuesday evening, which continued for hours, also did not surprise her. The day-after-day spectacle of the grieving mother brought an outpouring of concern not only for her but for the fate of the southern resident population. Every calf matters in a clan with only 75 members, said Billie Swalla, director of the Friday Harbor Laboratories of the University of Washington on San Juan Island, where the whale has been the talk of the research campus. 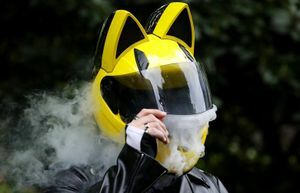 The story has drawn interest around the world as news accounts have circulated on the internet. “I am beside myself about this,” Michelle Connor, CEO of the nonprofit Forterra in Seattle, wrote The Seattle Times in an email.